I’ve already frogged five projects this year — mostly situations where the yarn and the pattern just weren’t cooperating. That decision is fairly easy for me to make. What I struggle with is the project that looks just great, fine really, but I don’t love it anymore. It’s been two years since my last Finish It or Frog It, and it seemed like a good time to have another round. 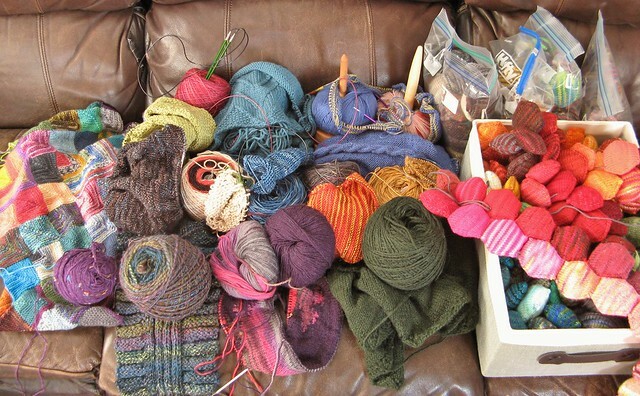 I pulled out all my current WIPs, including my hexipuffs and the Ongoing Forever Sock Yarn Blanket. Aside from those two projects, I’m pleased to say that everything else was cast on in 2013 — which to me means that I’m doing a good job of finishing/frogging in general. 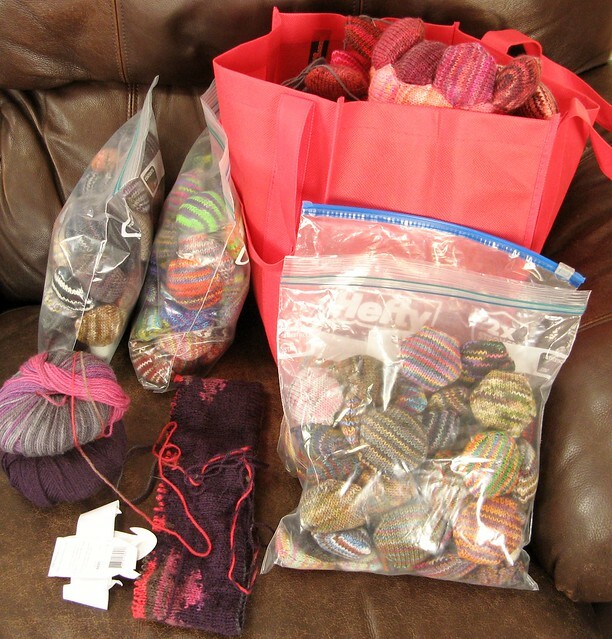 Hexipuffs, hexipuffs … what shall I do? I loved trading for minis and making puffs. Spreadsheets to track uniqueness! Lots of little finished projects! That part was fun. I even enjoyed laying out my puffs in a pretty gradient pattern. What has not been the least bit enjoyable is sewing them together. I tried a bit of a cheat to make it go faster, and it doesn’t look right. I think I need to go back and re-read the official instructions on making up the Beekeeper’s Quilt. But, in the mean time … that box of puffs taunts me — and, more importantly, it’s serving as a sticky spot that is stopping me from getting back to my other old WIP. So, while I’m not exactly frogging this one, I am putting it to bed (at least temporarily). I’m declaring my hexipuff project “done” in an as-is kind of way, and moving on to other things. Speaking of the Ongoing Forever Sock Yarn Blanket, I find that I really want to scratch that itch again. I even picked it up and did a new square for the first time in ages! Putting the hexipuffs to bed will free up this mental space for me — I’m keeping it on the “finish it” list once again. The top row (four projects) are all design projects — and all are sold, so I’m not even speculating. Deadlines range from Jan 15th to “sometime in fall 2014,” but all will be done this year. No decisions for these, since they all belong to someone else. Wild Mare — a mobius cowl by Sivia Harding in my favorite colorway of Tosh Light. It’s clearly in the “finish” camp, since I love everything about it. Mad Lamina — a scarf using my first-ever handspun gradient yarn. I’m not 100% sure I like how it’s working out, but I need to do at least two full repeats before I decide for sure. This one goes in the “finish” camp, but it’s on probation. Stormy Irish Hat — a cabled brimmed hat. I just started this one, and I’m loving it so far. Firmly in “finish” land. Farfalla in Fall — two-color garter-stitch shawl in Iachos colorways I helped to select. Love the colors, love the design, definitely “finish” this one :). Pretty Ginger Socks — Tosh Sock, a pattern from W(E)WMdFK?. These are a the 5th pair of socks that I owe my mom from Christmas 2013, so they are also “finish” list. Sleepy Molly — a scarf using my own handspun. I love the simple-yet-fun pattern, and I adore my precious yarn. It’s all I can do to keep my hands off this one, so it is a “finish” for sure. Liberty Fractal — a double-knit cowl in a fractal pattern. This one is a “frog” I’m sorry to say. I wanted SO BADLY to love it, but the double-knitting technique is tedious, and my first effort at it is disappointingly lumpy in too many places. Add to this the fact that the yarn color changes aren’t working out as nicely as I hoped …. time to send it to the frog pond. I know for a fact this project’s presence in my project basket is stopping me from starting projects I like better. Winter Beach for ME — my very own Winter Beach is a super-pretty heathered green alpaca. Can’t wait to finish this one. The long rows are just about killing me. It is the cardi that never ends! 🙂 This one will get some love as soon as I turn in the design due on Jan 15th. All the rest are officially on the “finish it” list! I hope the hexipuffs blanket gets to be more fun. All that sewing up sure sounds daunting. 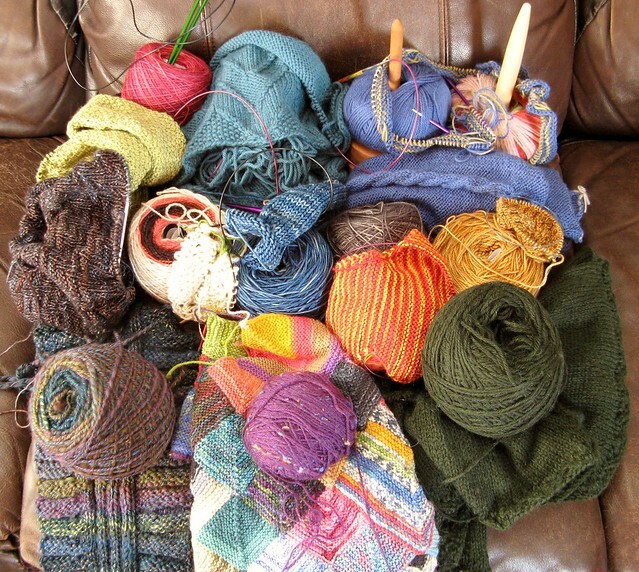 Wow that’s a lot of beautiful yarn. Good luck completing everything.